A vigil was held tonight in Harlem for the “Charleston9” – the nine black Christians who were killed last week by a deranged racist. The vigil included a prayer by cop-killer Assata Shakur. 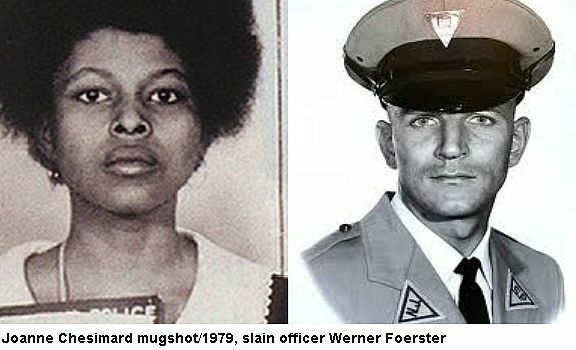 Cop killer Assata Shakur, formerly known as Joanne Chesimard, murdered New Jersey State Trooper Werner Foerster in 1973 and then fled to Cuba. Assata Shakur, a.k.a. Joanne Chesimard is a former(?) Black Panther and Black Liberation Army agitator and cop killer. She has been a fugitive from justice for nearly 40 years and openly thumbs her nose at her victim’s family while living in Cuba as a political asylee. In 1973, Chesimard shot and killed New Jersey state trooper Werner Foerster execution-style during a traffic stop. She is currently hiding from US authorities in Cuba. As Officer Foerster lay on the ground wounded and helpless, Shakur grabbed his gun and blasted two shots into his head. Tonight the left celebrated this killer.